It is the prevailing view that adaptive immune responses are initiated in secondary lymphoid organs. Studies using alymphoplastic mice have shown that secondary lymphoid organs are essential to initiate allograft rejection of skin, heart, and small bowel. The high immunogenicity of lungs is well recognized and allograft rejection remains a major contributing factor to poor outcomes after lung transplantation. We show in this study that alloreactive T cells are initially primed within lung allografts and not in secondary lymphoid organs following transplantation. In contrast to other organs, lungs are acutely rejected in the absence of secondary lymphoid organs. Two-photon microscopy revealed that recipient T cells cluster predominantly around lung-resident, donor-derived CD11c+ cells early after engraftment. 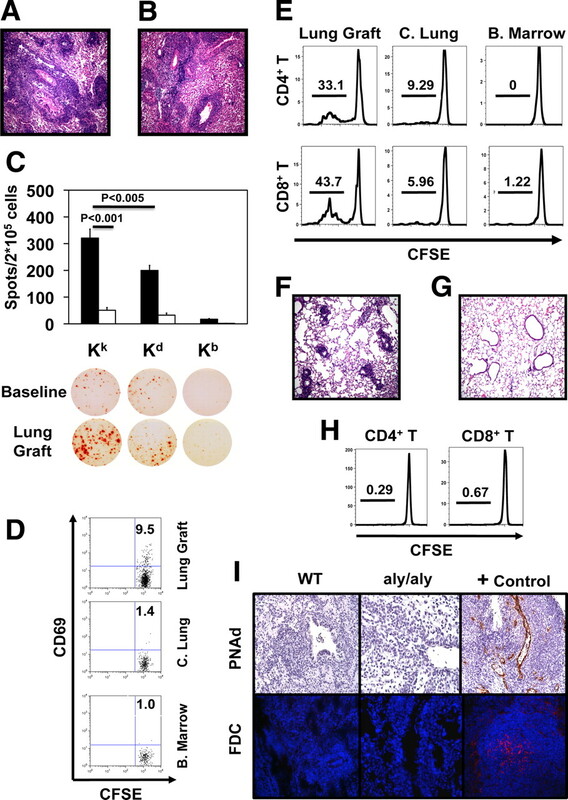 These findings demonstrate for the first time that alloimmune responses following lung transplantation are initiated in the graft itself and therefore identify a novel, potentially clinically relevant mechanism of lung allograft rejection. It is generally accepted that immune responses to foreign Ags are initiated in secondary lymphoid organs. However, the location where T cells initially encounter alloantigen after transplantation has been the focus of numerous investigations and is still unresolved. Medawar described the first stage of allograft rejection as “peripheral sensitization,” during which recipient lymphocytes interact with Ags in the graft itself (1). However, subsequent studies have challenged this concept. To this end, rejection of skin grafts can be prevented when afferent lymphatic drainage is disrupted, indicating the importance of trafficking to secondary lymphoid organs (2). These observations were extended by demonstrating that alymphoplastic (aly/aly) mice that lack peripheral lymph nodes and Peyer’s patches do not reject allogeneic skin grafts (3). Splenectomized aly/aly mice are unable to reject hearts, and cardiac allograft survival is dramatically prolonged after transplantation into splenectomized lymphotoxin-α-deficient or lymphotoxin-β receptor-deficient hosts (3, 4). Small bowel is not rejected when both donor and recipient lack secondary lymphoid organs, and graft vs host disease following bone marrow transplantation can be prevented by blocking the access of T cells to secondary lymphoid organs (5, 6). Thus, these studies suggest that encountering alloantigen through contact with APCs in secondary lymphoid organs is a requirement for T cell activation following transplantation. Lungs are particularly immunogenic, with clinical data demonstrating the highest rejection rates among all solid organ grafts. Similar to other organs, the majority of studies examining pulmonary immune responses have concluded that the activation of T cells occurs exclusively in draining lymph nodes and that the lung is not a suitable environment for the activation of naive T cells (7, 8, 9). However, there also exist reports that pulmonary APCs have the capacity to activate CD4+ T cells locally within the lung and that adaptive immune responses to respiratory viruses can be generated in mice that lack secondary lymphoid organs (10, 11). We asked whether the priming of alloimmune responses to lungs and their rejection are dependent on secondary lymphoid organs. C57BL/6 (B6), C3H/HeJ (C3H), CBA/Ca (CBA), and B6 CD45.1+ mice were purchased from The Jackson Laboratory. B6 CD11c+-enhanced yellow fluorescent protein (EYFP)3 -positive mice were a gift from M. Nussenzweig (The Rockefeller University, New York, NY). Male B6 aly/aly mice (CLEA Japan) were bred with female C3H mice. Their B6C3F1 aly/+ offspring were intercrossed to produce B6C3F2 mice, which were then screened for expression of the aly mutation of NF-κB-inducing kinase and genotyped for H-2Kk and Kb (5). B6C3F2 aly/aly mice expressing at least one H-2Kk allele (B6C3F2 Kk/b aly/aly) were used as donors. Lungs and hearts were transplanted in 8- to 10-wk old mice (12). Graft histology was assessed in a blinded fashion. CD90+ T cells were purified from spleens of B6, B6 CD45.1+, or CBA mice with magnetic beads (Miltenyi Biotec). We injected 107 CFSE-labeled B6 CD45.1+ or sorted B6 CD45.1+ CD44low T cells for flow cytometric studies and 107 CellTracker Red CMTPX-labeled CBA or B6 T cells for imaging studies. CD8+ T cells (2 × 105), purified from spleens of untransplanted B6 aly/aly mice or from lung allografts 7 days after B6C3F2 Kk/b aly/aly → splenectomized B6 aly/aly transplantation were cultured with irradiated stimulators (6 × 105) (syngeneic H-2Kb, allogeneic H-2Kk, or third party H-2Kd) at a 1:3 ratio in plates coated with capture mouse IFN-γ-specific mAb (BD Biosciences). After 24 h, cells were incubated with biotinylated IFN-γ-specific Ab. Cells were stained with fluorochrome-labeled anti-CD45.1, anti-CD45.2, anti-CD4, anti-CD8, and anti-CD69 Abs and their isotype controls (12). Tissue was imaged with a custom-built, video-rate two-photon microscope. Fluorescence emission was detected as red, green and blue signal channels. Each plane consisted of an image of 200 × 225 μm. The z-stacks were acquired by taking 31 sequential steps at 2.5-μm spacing. We averaged 15 video frames for each z-slice. Tissue volumes (75 × 200 × 225 μm) containing 11–13 cells were analyzed (13). Neighboring distributions (cells within a centroid to centroid distance <25 μm in three-dimensional space) were compared with a Monte Carlo simulation of randomly distributed cells of equal density. Immunostaining was performed as previously described (14). Primary Abs used were anti-peripheral node addressin (PNAd; MECA-79) and anti-CD21 (7G6) (BD Biosciences). Neighboring distribution of T cells was tested by Mann-Whitney U test, and CD69 expression and ELISPOT assays were analyzed with Student’s t test. In humans, acute rejection of lungs precedes that of hearts after heart-lung transplantation (15). We noticed that C3H lungs already have histological evidence of acute rejection 3 days after transplantation into B6 hosts (Fig. 1⇓A). To determine where T cells are activated following lung transplantation, we injected CFSE-labeled CD45.1+ T cells into B6 recipients of C3H lungs at the time of engraftment. Three days later we observed marked proliferation of CD4+ and CD8+ T cells in the transplanted lung, but not in the draining lymph nodes or the spleen (Fig. 1⇓B). Memory T cells, generated through in vivo immunization with alloantigen, can mediate cardiac allograft rejection in the absence of secondary lymphoid organs (16). To evaluate whether naive T cells can be activated in lung allografts, we injected CD44lowCD45.1+ T cells into B6 recipients of C3H lungs. We observed proliferation of these naive T cells in lung allografts, but not in the draining lymph nodes 3 days after transfer (Fig. 1⇓C). Thus, priming of alloreactive T cells in lungs is not dependent on preexisting memory T cells. The absence of proliferation in draining lymph nodes and spleen could be explained by a temporal requirement for alloantigen presentation in secondary lymphoid organs. To evaluate the site of T cell activation at later time points, we injected CFSE-labeled CD45.1+ T cells 4 days after transplantation and analyzed their proliferation 3 days later. Again, there was marked proliferation of CD4+ and CD8+ T cells in the lung allografts (Fig. 1⇓D). In addition, there was significant proliferation of CD4+ and CD8+ T cells in the draining lymph nodes. By 7 days after transplantation, C3H → B6 lung allografts have evidence of severe acute rejection (Fig. 1⇓E). Syngeneic B6 lungs are free of inflammation 7 days after transplantation and T cells do not proliferate after injection into the recipients of syngeneic lungs (Fig. 1⇓, F and G). Lung transplantation in wild-type mice. A, C3H → B6 lung grafts on postoperative day 3. 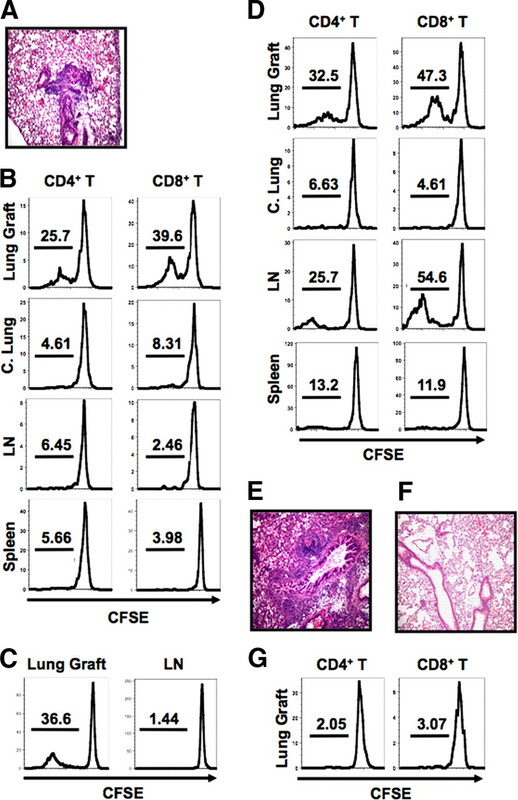 B, Division of adoptively transferred CFSE-labeled CD45.1+ T cells in lung grafts, contralateral lungs (C. Lung), draining lymph nodes (LN) and spleen 3 days after C3H → B6 lung transplantation. C, Division of adoptively transferred, CFSE-labeled CD44lowCD45.1+ T cells 3 days after C3H → B6 lung transplantation. D, Division of T cells injected on postoperative day 4 and analyzed 3 days later after C3H → B6 lung transplantation. E and F, C3H → B6 (E) and B6 → B6 (F) lung grafts on postoperative day 7. G, Division of T cells injected on day 0 and analyzed in lung grafts on postoperative day 3 after B6 → B6 transplantation. Data are representative of at least three independent experiments. Graft-resident, donor-derived dendritic cells have been shown to migrate to the recipient’s secondary lymphoid organs after transplantation, where they are widely thought to initiate alloimmune responses. Specifically, within a few days after vascularized heart transplantation, donor-derived dendritic cells colocalize with CD4+ T cells in the recipient’s spleen (17). We next wanted to determine where T cells are localized in lung grafts at early time points after transplantation. For this purpose, we transplanted B6 lungs that express EYFP under the endogenous CD11c promoter (CD11c-EYFP+) into CBA hosts and evaluated the recipients with two-photon microscopy 30 h later. We have previously reported that transplantation of B6 lungs into CBA hosts results in allograft rejection comparable to that observed in the C3H → B6 strain combination (12). We observed clustering of T cells in allogeneic lungs (Fig. 2⇓A). Notably, many T cells in lung allografts clustered around donor-derived CD11c+ cells with a dendritic morphology. The clustering of adoptively transferred T cells has been described as a sensitive readout for T cell activation and has also coincided with CD69 expression on adoptively transferred, graft-infiltrating T cells at this time point (13). To quantitatively assess T cell clustering, we compared the neighboring distribution of adoptively transferred, recipient-matched T cells in allogeneic grafts to a random T cell distribution. The allogeneic T cell neighboring distribution was significantly different from a simulated random neighboring distribution, and graft-infiltrating T cells had up to seven neighbors within 25 μm. Only rare donor-derived CD11c+ cells were present in draining lymph nodes of allogeneic lung recipients at this time point, and T cells were randomly distributed (Fig. 2⇓B). At 4 days after transplantation we observed an increased number of donor-derived CD11c+ cells in the lymph nodes. When we injected T cells 4 days after engraftment and evaluated those 30 h later, we found that T cells clustered around CD11c+ cells in both lung graft and draining lymph nodes (Fig. 2⇓, C and D). The neighboring distribution in syngeneic lungs did not differ significantly from a random T cell distribution (Fig. 2⇓E). Thus, these observations indicate that in addition to activation in secondary lymphoid organs, T cells can be primed in the lung graft itself after transplantation. T cell activation in the graft may be responsible for the initiation of lung rejection. T cell clustering in lung grafts and draining lymph nodes. A, B6 CD11c-EYFP+ → CBA graft showing adoptively transferred CBA T cells (red), CD11c-EYFP+ cells (green), and collagen fibers (blue). T cell neighboring analysis was performed on 14 representative z-stacks from three independent experiments (filled bars) and was significantly different from that performed on randomly placed T cells of equal density (hatched bars) (p < 0.05). Dot plot shows CD69 expression (11.5 ± 1%; n = 3) on adoptively transferred, CFSE-labeled, graft-infiltrating congenic T cells in C3H → B6 transplants at the same time point (p < 0.05, compared with T cells isolated from native untransplanted lungs (3.5% ± 1.4; n = 3)). B, Adoptively transferred CBA T cells in draining lymph node 30 h after B6 CD11c-EYFP+ → CBA transplantation. C and D, CBA T cells injected on postoperative day 4 after B6 CD11c-EYFP+ → CBA transplantation and analyzed in lung grafts (C) and draining lymph nodes (D) 30 h after injection. E, B6 T cells, injected into B6 CD11c-EYFP+ → B6 transplants on day 0 and analyzed in lung grafts 30 h later. T cell neighboring distributions in C and D (p < 0.05), but not in B and E (p > 0.1), were significantly different from those of randomly placed T cells. Space bar, 20 μm. The aly/aly mice are a highly stringent model for evaluating the role of secondary lymphoid organs in promoting immune responses in transplant models (18) (3). Importantly, naive aly/aly T cells are able to mount productive alloimmune responses and trigger allograft rejection (3). We confirmed previous observations that although wild-type B6 mice reject C3H hearts acutely, C3H hearts transplanted into splenectomized B6 aly/aly hosts survive long term, indicating that secondary lymphoid organs are necessary for cardiac allograft rejection (3). Although C3H hearts transplanted into wild-type B6 recipients have histological evidence of acute rejection at day 7, they remain free of inflammation at both 7 and 100 days after transplantation into splenectomized B6 aly/aly hosts (data not shown). However, C3H lungs show severe acute rejection 7 days after transplantation into splenectomized B6 aly/aly hosts (Fig. 3⇓A). To exclude the possibility that the rejection of C3H lungs was dependent on lymph nodes within the donor lung, we used B6C3F2 Kk/b aly/aly mice as donors (5, 19). Seven days after transplantation into splenectomized B6 aly/aly hosts, B6C3F2 Kk/b aly/aly lungs had severe rejection (Fig. 3⇓B). The frequency of CD8+ T cells isolated from acutely rejecting grafts producing IFN-γ in response to donor alloantigen was significantly higher than that of CD8+ T cells from untransplanted B6 aly/aly mice (Fig. 3⇓C). Although, consistent with previous reports, graft-infiltrating CD8+ T cells were reactive to both donor and third party stimulators, significantly more CD8+ T cells produced IFN-γ after stimulation with the donor than third party Ags (20). We next injected CFSE-labeled CD45.1+ T cells into splenectomized B6 aly/aly recipients of B6C3F2 Kk/b aly/aly lungs at the time of engraftment. At 30 h after adoptive transfer CD69 was expressed on a portion of T cells within the lung graft and to a markedly lower extent within the contralateral lung or bone marrow, a site where T cells can be activated in the absence of secondary lymphoid organs (Fig. 3⇓D) (21). We did not observe division of T cells at 30 h following adoptive transfer. After 3 days, T cells within lung grafts, but not contralateral lungs or bone marrow, had undergone marked proliferation, comparable to that seen after C3H → B6 transplantation (Fig. 3⇓E). Similarly, we observed proliferation of adoptively transferred CD44low naive T cells within lung grafts (supplemental Fig. 1).4 With or without adoptive transfer B6C3F2 Kk/b aly/aly lungs had evidence of acute rejection 3 days after transplantation into splenectomized B6 aly/aly recipients (Fig. 3⇓F). Similar to native aly/aly lungs, syngeneic B6 aly/aly lungs harvested 7 days after transplantation have virtually no inflammation, and T cells did not proliferate after injection into splenectomized B6 aly/aly recipients of B6 aly/aly lungs (Fig. 3⇓, G and H). Thus, we show for the first time that secondary lymphoid organs are not necessary for the activation of alloreactive T cells and acute rejection following lung transplantation. Lung transplantation in the absence of secondary lymphoid organs. A, C3H → splenectomized B6 aly/aly lung grafts on postoperative day 7. B, B6C3F2 Kk/b aly/aly → splenectomized B6 aly/aly lung grafts on postoperative day 7. C, Frequencies of CD8+ T cells isolated from spleens of untransplanted B6 aly/aly mice (n = 3) or from B6C3F2 Kk/b aly/aly → splenectomized B6 aly/aly lung transplants (postoperative day 7) (n = 5) producing IFN-γ after culture with donor-type (Kk), recipient-type (Kb), or third party (Kd) stimulators. D and E, CD69 expression on T cells in lung grafts (11.2 ± 0.7%) vs contralateral lungs (C. Lung; 2.5 ± 0.6%, p < 0.05) and bone marrow (B. marrow; 2.8 ± 0.9%, p < 0.05) at 30 h (n = 4) and T cell division 3 days after injection into B6C3F2 Kk/b aly/aly → splenectomized B6 aly/aly transplants. F, B6C3F2 Kk/b aly/aly → splenectomized B6 aly/aly lungs on postoperative day 3. G, B6 aly/aly → splenectomized B6 aly/aly lungs on postoperative day 7. H, Proliferation of adoptively transferred T cells in lung grafts 3 days after B6 aly/aly → splenectomized B6 aly/aly transplantation. Data are representative of at least three independent experiments. I, Immunostaining for PNAd (top; original magnification ×200) and FDC (bottom; original magnification ×400) on C3H → B6 and B6C3F2 Kk/b aly/aly → splenectomized B6 aly/aly lung grafts on postoperative day 7. Positive and isotype control Ab staining shown on axillary lymph node (PNAd) and spleen (FDC) from wild-type (WT) B6 mouse. Our findings may explain previous clinical observations documenting a very rapid onset of acute lung rejection (15). Based on morphological studies in the rat model, it was thought that rapid initiation of lung rejection could be attributed to a local proliferative response facilitated by the mucosal immune system such as bronchus-associated lymphoid tissue (BALT) (22). Importantly, unlike rats in which BALT is constitutively expressed, BALT is absent in the lungs of healthy humans and mice (23). Rejected mouse grafts in both wild-type and aly/aly mice lacked features characteristic of BALT such as follicular dendritic cells (FDC) or expression of peripheral lymph node addressin, indicating that organized BALT is not required to initiate alloimmune responses to lungs (Fig. 3⇑I and supplemental Fig. 2). Direct allorecognition, the pathway responsible for the initiation of allograft rejection, is thought to depend on the migration of donor-derived APCs to secondary lymphoid organs, where they encounter and activate alloreactive T cells (17). Although our results suggest that this pathway is also operative after lung transplantation, as we observe T cell clustering and proliferation in draining lymph nodes at later time points, the activation of T cells within the lung itself suffices to initiate acute rejection. We show that recipient T cells cluster predominantly around lung-resident, donor-derived CD11c+ cells at early time points after transplantation. To our knowledge, this is the first observation that T cells can be primed by interactions with dendritic cells outside of secondary lymphoid organs following transplantation. Future studies need to address which signals within lungs are essential for the initiation of alloimmune responses. ↵1 D.K. was supported by National Heart, Lung, and Blood Institute Grant 1K08HL083983 and by the Thoracic Surgery Foundation for Research and Education. ↵3 Abbreviations used in this paper: EYFP, enhanced yellow fluorescent protein; BALT, bronchus-associated lymphoid tissue; FDC, follicular dendritic cell; PNAd, peripheral node addressin. Medawar, P. B.. 1958. The homograft reaction. Proc. R. Soc. London 149: 145-166. Barker, C. F., R. E. Billingham. 1968. The role of afferent lymphatics in the rejection of skin homografts. J. Exp. Med. 128: 197-221. Lakkis, F. G., A. Arakelov, B. T. Konieczny, Y. Inoue. 2000. Immunologic ‘ignorance’ of vascularized organ transplants in the absence of secondary lymphoid tissue. Nat. Med. 6: 686-688. Zhou, P., K. W. Hwang, D. Palucki, O. Kim, K. A. Newell, Y. X. Fu, M. L. Alegre. 2003. Secondary lymphoid organs are important but not absolutely required for allograft responses. Am. J. Transplant. 3: 259-266. Wang, J., Y. Dong, J. Z. Sun, R. T. Taylor, C. Guo, M. L. Alegre, I. R. Williams, K. A. Newell. 2006. Donor lymphoid organs are a major site of alloreactive T-cell priming following intestinal transplantation. Am. J. Transplant. 6: 2563-2571. Beilhack, A., S. Schulz, J. Baker, G. F. Beilhack, R. Nishimura, E. M. Baker, G. Landan, E. I. Herman, E. C. Butcher, C. H. Contag, R. S. Negrin. 2007. Prevention of acute graft-versus-host disease by blocking T-cell entry to secondary lymphoid organs. Blood 111: 2919-2928. Lawrence, C. W., T. J. Braciale. 2004. Activation, differentiation, and migration of naive virus-specific CD8+ T cells during pulmonary influenza virus infection. J. Immunol. 173: 1209-1218. Yoon, H., K. L. Legge, S. S. Sung, T. J. Braciale. 2007. Sequential activation of CD8+ T cells in the draining lymph nodes in response to pulmonary virus infection. J. Immunol. 179: 391-399. Ingulli, E., C. Funatake, E. L. Jacovetty, M. Zanetti. 2009. Cutting edge: antigen presentation to CD8 T cells after influenza A virus infection. J. Immunol. 182: 29-33. Constant, S. L., J. L. Brogdon, D. A. Piggott, C. A. Herrick, I. Visintin, N. H. Ruddle, K. Bottomly. 2002. Resident lung antigen-presenting cells have the capacity to promote Th2 T cell differentiation in situ. J. Clin. Invest. 110: 1441-1448. Okazaki, M., A. S. Krupnick, C. G. Kornfeld, J. M. Lai, J. H. Ritter, S. B. Richardson, H. J. Huang, N. A. Das, G. A. Patterson, A. E. Gelman, D. Kreisel. 2007. A mouse model of orthotopic vascularized aerated lung transplantation. Am. J. Transplant. 7: 1672-1679. Zinselmeyer, B. H., J. Dempster, A. M. Gurney, D. Wokosin, M. Miller, H. Ho, O. R. Millington, K. M. Smith, C. M. Rush, I. Parker, et al 2005. In situ characterization of CD4+ T cell behavior in mucosal and systemic lymphoid tissues during the induction of oral priming and tolerance. J. Exp. Med. 201: 1815-1823. Okazaki, M., A. E. Gelman, J. R. Tietjens, A. Ibricevic, C. G. Kornfeld, H. J. Huang, S. B. Richardson, J. Lai, J. R. Garbow, G. A. Patterson, et al 2007. Maintenance of airway epithelium in acutely rejected orthotopic vascularized mouse lung transplants. Am. J. Respir. Cell Mol. Biol. 37: 625-630. McGregor, C. G., J. C. Baldwin, S. W. Jamieson, M. E. Billingham, S. A. Yousem, C. M. Burke, P. E. Oyer, E. B. Stinson, N. E. Shumway. 1985. Isolated pulmonary rejection after combined heart-lung transplantation. J. Thorac. Cardiovasc. Surg. 90: 623-626. Chalasani, G., Z. Dai, B. T. Konieczny, F. K. Baddoura, F. G. Lakkis. 2002. Recall and propagation of allospecific memory T cells independent of secondary lymphoid organs. Proc. Natl. Acad. Sci. USA 99: 6175-6180. Larsen, C. P., P. J. Morris, J. M. Austyn. 1990. Migration of dendritic leukocytes from cardiac allografts into host spleens. A novel pathway for initiation of rejection. J. Exp. Med. 171: 307-314. Tesar, B. M., G. Chalasani, L. Smith-Diggs, F. K. Baddoura, F. G. Lakkis, D. R. Goldstein. 2004. Direct antigen presentation by a xenograft induces immunity independently of secondary lymphoid organs. J. Immunol. 173: 4377-4386. Hricik, D. E., V. Rodriguez, J. Riley, K. Bryan, M. Tary-Lehmann, N. Greenspan, C. Dejelo, J. A. Schulak, P. S. Heeger. 2003. Enzyme linked immunosorbent spot (ELISPOT) assay for interferon-γ independently predicts renal function in kidney transplant recipients. Am. J. Transplant. 3: 878-884. Feuerer, M., P. Beckhove, N. Garbi, Y. Mahnke, A. Limmer, M. Hommel, G. J. Hammerling, B. Kyewski, A. Hamann, V. Umansky, V. Schirrmacher. 2003. Bone marrow as a priming site for T-cell responses to blood-borne antigen. Nat. Med. 9: 1151-1157. Prop, J., C. R. Wildevuur, P. Nieuwenhuis. 1985. Lung allograft rejection in the rat. II. Specific immunological properties of lung grafts. Transplantation 40: 126-131.